The lifelike movements of the robot mean it can navigate aquatic environments without triggering any discernible alarm among marine life. As the old saying goes, there are indeed plenty of fish in the sea. But not many have servo motors, a lithium polymer battery, and a 3D-printed silicone head filled with baby oil. 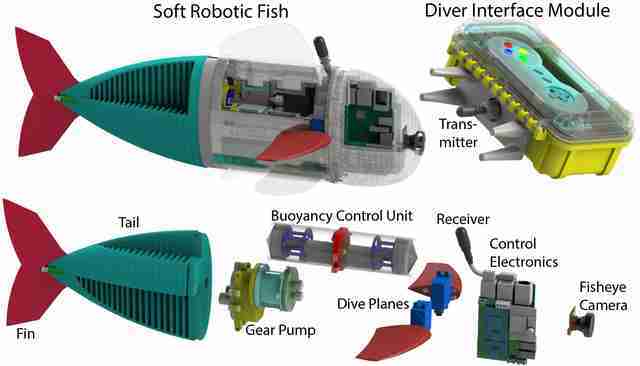 Researchers at MIT unveiled March 21 their latest hi-tech endeavor, a lifelike underwater robot fish that can navigate aquatic environments and capture real-time video and data with on-board cameras and sensors. Dubbed SoFi, the soft robot was developed by the university’s Computer Science and Artificial Intelligence Laboratory (CSAIL). Plenty of autonomous underwater vehicles can capture video, of course. The problem is that traditional underwater robots look and move like… well, like underwater robots. Fish don't like them. Noisy propellers or water jets tend to disturb the underwater environments and scare away marine life. SoFi, on the other fin, is designed to blend right in. Made from silicone and flexible plastics, the soft robot employs biomimetic design principles to approximate the look and movement of an actual fish. 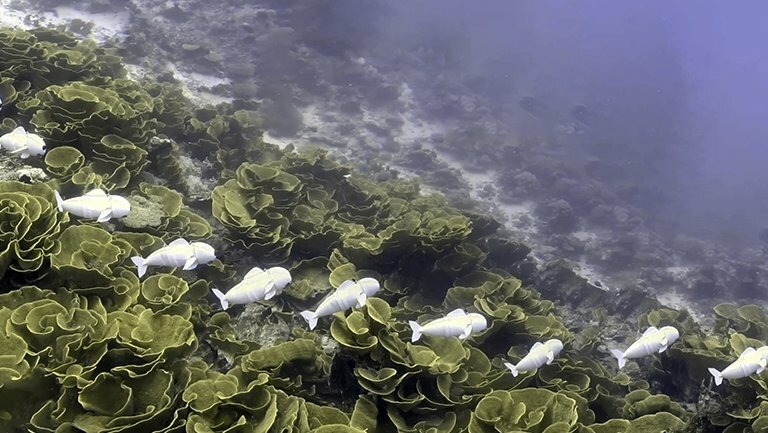 In preliminary tests, the SoFi bot was able to swim in a Pacific reef near Fiji without causing any discernible alarm or disruption among adjacent fish. That's important because SoFi should be able to obtain video other underwater bots were unable to gather, said MIT researcher Robert Katzschmann, lead author of an article in the journal Science Robotics describing the robot. B-roll demonstrating remote-controlled navigation of the soft robotic fish in the Pacific Ocean. Six dives were conducted over the course of three days, exploring the Somosomo Strait in Taveuni, Fiji. The robot's locomotion system consists of several parts. The onboard lithium battery (a standard smartphone model, actually) powers two balloon-like chambers in the robot's tail. When inflated or deflated, the chambers operate like pistons, creating a side-to-side swimming motion. An internal buoyancy control unit allows the fish to adjust its position vertically, diving to a range of up to 18 meters below the surface. The 3D-printed head, meanwhile, holds the video camera and all the electronics components. To reduce the chance of water leaks, the head is actually filled with baby oil, a fluid that does not compress from pressure changes during dives. The SoFi robot is not fully autonomous. Instead, it is controlled by a trailing diver or floating operator with a customized acoustic communications system, which was also developed by the MIT team. For now, the robot fish has to be within 20 meters of the controller, which must also be submerged. “We could also increase that distance by making the signal stronger, but we wanted to be sensitive about not disturbing marine life, which is why we chose the signal levels that we did,” Katzschmann said. The team's next steps include plans to increase the speed of the fish by improving the pump system. They also hope to modify the on-board camera so the bot can automatically follow real fish, and to eventually build additional swimmy bots for biologists to study particular environments. As to potential far-future applications, Katzschmann said the sea's the limit. The project is part of a larger initiative at MIT CSAIL focused on soft robots, which researchers say have the potential to be safer, sturdier, and more nimble than traditional robots in underwater environments. The SoFi bot is also part of an accelerating movement in the robotics field to develop and deploy swimming and diving robots. The Shell Ocean Discovery Xprize is a $7 million dollar global competition to develop new autonomous technologies for exploring and mapping the ocean floor. On March 7, Xprize officials announced the nine finalists for the final phase of the three-year competition. MIT's team isn't part of the Xprize competition, but it's good news for anyone invested in underwater robot research, said Jyotika Virmani, project lead and senior director with the company's Energy and Environment Group. Virmani said she suspects the MIT robofish will have some company in coming years. “We're in a moment in our human history where we can develop these fantastic underwater robots that will allow us to explore the ocean environment in ways that we haven't been able to before,” she said.